This is my first Christmas since leaving my family, ex-fiancé, and high-paying advertising job in Dallas for a quilt shop in the middle of Ohio’s Amish Country. Yes, you heard that right. I left that all behind to live and quilt with the Amish. Dead bodies not withstanding, it’s the best decision I have ever made. Trust me the ex-fiancé wasn’t that hard to leave behind. The health insurance and 401k were more of a challenge. Nevertheless, I took the leap with my trusty French bulldog, Oliver, at my side—what else does a girl need? I do miss my family, but I can’t leave the quilt shop and go back to Texas for Christmas. If I did, I would miss the big before Christmas sales and promotions the shops of Rolling Brook, including mine, Running Stitch, are doing. I have to be there. This is my last big chance before the quiet winter to make some income for the shop. Thankfully, Anna Graber, who was my Amish Aunt Eleanor’s dearest friend, has invited me to spend holiday season with her and her son Jonah and his family. I’m so looking forward to it. Anna has been talking about the menu for weeks and my mouth has been watering to taste it for just as long… Oliver’s too. He will be ready for those table scraps. This is what we are having, which is an Amish Christmas menu. -Pie, pie, pie, so much pie! My beauty pageant coordinator mother was not to happy when I told her I would be spending Christmas in Ohio, so my parents will be here for Christmas Day to experience a real country Christmas. My society mom will hate it. 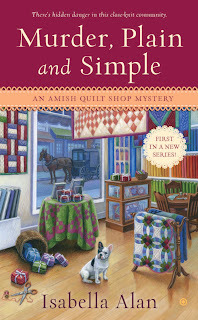 In a comment, tell Angie Braddock your favorite Christmas food for a chance to win a copy of MURDER, PLAIN AND SIMPLE, book one in Amish Quilt Shop Mystery Series. One winner will be selected from the comments. Looking forward to book 2 and the surprise. 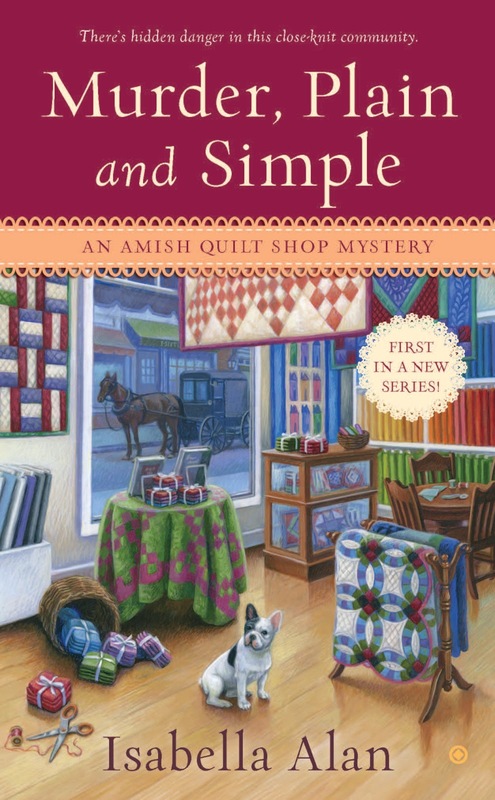 I have read the first Amish Quilt mystery and enjoyed it very much. I like the blend of Amish culture with story line. Looking forward to reading more of this series. It is hard to spend a holiday away from your family. I spent one Christmas away and hated it. They didn't do things the way my family did. fortunately, I got divorced before I had to do that again. Still it was my first taste of chicken and dumplings so it was almost worth it. We don't have a traditional menu like we do for Thanksgiving. We experiment, but we always have a decadent dessert. That is always my favorite. My favorite Christmas food is peppermint bark since that's the only time of year I get it. For years my favorite Christmas dish was my Granny's chocolate meringue pie. It's still my favorite, but I never learned to make it like she did, so it's just not the same. So I created my own new favorite: Peppermint Fudge Cake Balls. I love a great fruitcake like my grandmother made back in the 40s/50s. Even fruitcake haters loved it after they had a taste! My favorite Christmas dessert is a Brown Sugar Pound cake. I make lots of cookies and it's hard to choose a favorite. I do love fruit cake! I love my Buttermilk pies that I make during the holidays. Baklava is something I love, but only have at the holidays. I can't pick just one! I love all my mom's cookies including spritz, linzer, and kolache. My favorite Christmas food is my mom's Kris Kringle cookies. They're a simple cut out cookie, but oh so good and a sure sign that Christmas is almost here! My favorite christmas food is cream cheese fudge. My favorite food is any shared with others in our very small family [and sadly, getting smaller family :-( ] . My favorite foods are Sand Tarts and Pumpkin Cookies. My favorite Christmas food is Swedish cookies. This was my favorite treat since childhood. My mother always made me a special tin which I kept hidden because those cookies were so wonderful. Homemade peanut butter fudge! Thanks for the chance to win your book! If nothing else I try to get Spritz cookies made, my mom made them, then my oldest sister and now I do. While in Pa. Dutch country, (long ago) I got a recipe for peanut butter pie . Every time I make it , it reminds me of the great times I had there. I live in Ohio. Christmas food for me is just like Thanksgiving food; I love turkey and pumpkin pie. I also like food gifts like cheese and summer sausage. My favorite Christmas foods are the ones made by my nana and I had to learn without her. Zeppole and struffoli. Both are Deep fried and yummy. My favorite Christmas cookie is Spritz, they just melt in your mouth! I miss all the big dinners from when I was a kid now that there are only two of us. My family had food on the table all day and you could sample and nibble the whole day...it was awesome! Leftover turkey and (uncooked) cranberry sauce in a sandwich! For some reason it's become tradition for us to have a smoked brisket as the main course for Christmas dinner. It's now my favorite and I fix traditional sides to accompany it. And lots of baked treats to top it off. There isn't a thing that is not a favorite when it comes to all the goodies that are part of Christmas. It really depends on the year. I love Pfeffernusse cookies a lot, maybe too much, lol. I also enjoy Butterscotch Gingerbread cookies. For dinner I like Brown Sugar Ham. I hope the recipe for the Bread Pudding is in the book! We love to bake sugar cookies and decorate them for Christmas along with a ton of other goodies for the holidays. Thank you for a wonderful Holiday Giveaway! The story, city versus country and the wonderful characters will make me have to buy book 2, especially for the surprise reveal! Congrats Sharon! You won! Sharon please email me at authoramandaflower@gmail.com with your mail address and I will send out your book! Can't wait for the new book! My favorite Christmas food is my mom's rugala(sp) & peanut butter fudge. My friend's Watergate Salad. I have the recipe & I make but it never tastes as good as hers. So now she brings the Watergate Salad & bring the cheeseball that she loves. It works! They're both traditions at our Holiday gatherings for our Family & Friends. My favorite Christmas food is my sweet potato rum pound cake. It's a sweet potato cake with a rum/sugar glaze. What isn't to like? My favorite Christmas food is the homemade peanut brittle. I make is from scratch every year and it is delicious. Sometimes I will substitute cashews for the peanuts (just as good). Thank you for a chance to win and Happy Holidays! My favorite Christmas food is Rum Balls! Yum! My favorite Christmas food is fudge. Lots of varieties of fudge. YUM and Pie and fruitcake that is mostly nuts. While not normally what one would think of, my favorite Christmas food is nachos. I know, I know, it's weird...but it's tradition. On Christmas Eve, we make a big plate of nachos, turn off the lights, turn on the tree, and snuggle down to watch the Polar Express. Ahh... So, Christmas to me is a big plate of cheese, meat and olive covered tortilla chips! We just returned last night from our week long trip to PA and a few days of that time in Lancaster as well as Bethlehem and Hershey. We truly enjoyed the food in Lancaster, one of which was Shoo Fly Pie. One of my favorite desserts is pecan pie which I try not to make too often as I tend to be make many pies and not as many people eat the pecan so I get most of it, and I surely do not need all those calories. I also make a rich butter cookie of German origin which I dip in colored sugar for Christmas and my family just loves to have an endless supply of those for the month of December and into January. Would love to win a copy of Murder Plain and Simple as I have not purchased that book yet. Thank you. Cynthia B.
Buckeye candy made from scratch. Mymother's fruitcake. She made it without candied fruit. It was filled with prumes, riaisons and loads of different dried fruit and was so moist. After it was baked, She poured brandy on it every evening. We gave it to relatives and it was all eaten, not given away! peanut butter candy my mother made. What great selection! Thanks to everyone who shared their favorite Christmas dishes. The winner of Murder, Plain and Simple is... Sharon Braswell. Sharon please email me at authoramandaflower@gmail.com with your mail address and I will send out your book!